Development agencies tend to think that telling people about the detrimental social, environmental and economic outcomes associated with corruption will increase resistance against it. In turn, around the world, donors and others have spent millions of dollars on anti-corruption advocacy. Papua New Guinea is no different – the local media pumps out anti-corruption messages across a variety of platforms, with PNG’s anti-corruption advocates regularly speaking out about the evils of corruption. However, there is little evidence that these efforts have achieved what they set out to: to encourage more people to resist corruption. In fact, this is a problem for global anti-corruption efforts: the only robust study into the effects of anti-corruption messaging on citizens showed that anticorruption messages can significantly backfire. One of us (Caryn) recently undertook a survey experiment in Jakarta, which showed that respondents who were not exposed to a message about corruption were more willing to report it. This suggests that efforts to raise awareness about corruption might be a waste of money. However, we need to be careful interpreting these results. Findings from Jakarta might not translate into other contexts. With this in mind, in 2017 we tested the impact of four contextually appropriate anti-corruption messages in PNG’s capital, Port Moresby. The messages, each a separate narrative, emphasised the legal, moral and communal aspects of corruption and anti-corruption, as well as its ubiquity. We surveyed over 1,500 people to find out which messages might persuade people to think differently about and resist corruption. Researchers randomly assigned respondents to one of five groups. Respondents in four groups were read one of the themed messages about corruption, and shown a photograph capturing this message, before researchers asked them questions about corruption and anti-corruption. The fifth group, the control, answered the same questions but were not read a message nor shown a photo. Our recently published discussion paper highlights three key findings. First, our results challenge the notion that awareness raising efforts will inevitably turn people off wanting to report – as the study in Jakarta found. While exposure to three of the fielded messages (messages that stressed community impacts, illegality, and, to a lesser extent, the widespread nature of corruption) made respondents’ aware of how widespread corruption is, none of the messages triggered pessimistic views about reporting corruption or an unwillingness to report corruption. Second, the message that stressed the impacts corruption has on local communities made respondents’ more aware of corruption, and increased their willingness to report. What is more, we found that promoting the impacts of corruption on local communities does not promote particularistic feelings about corruption or anti-corruption. That is, exposure to this message did not lead citizens to only support local anti-corruption efforts or think that corruption is permissible if it helps the local community. This suggests that messages that stress local impacts of corruption could effectively encourage reporting on a national scale. Finally, we suggest that legally toned messages can raise a red flag about corruption as a problem, but will likely not motivate citizens substantially to think and act differently when they observe corruption occurring. This might be because where the state is weak, citizens’ concerns about social, economic and cultural issues trump the desire to follow poorly enforced laws – as has been found in PNG (see this pay-walled article) and other contexts. However, these tentative findings would benefit from further research in other environments. In sum, we find that in PNG, messages that stress the impacts of corruption on local communities will likely motivate citizens to act against it. This does not mean that citizens will report. As we have shown elsewhere [PDF], reporting also relies on the state providing accessible, safe and reliable reporting mechanisms. While increasing awareness about corruption is important, even the most contextually nuanced message cannot overcome the inadequacies of local anti-corruption organisations. However, getting anti-corruption messaging right, in PNG and elsewhere, would be a step in the right direction. 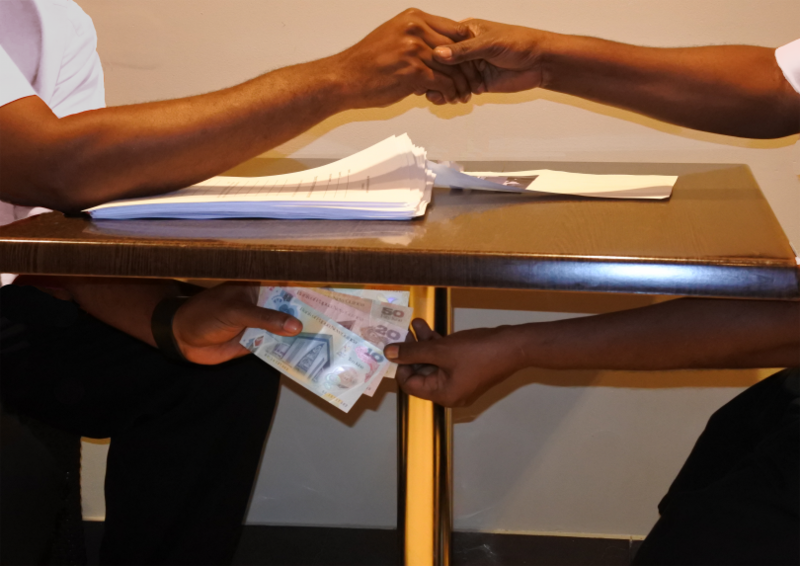 This blog is based on the authors’ discussion paper, “Overcoming collective action problems through anti-corruption messages”, jointly published by the Development Policy Centre and Developmental Leadership Program. Did the researchers ask about the perceptions of the consequences of corruption on the offender? If people see that the big shots can get away with corruption won’t they be tempted to try it themselves or turn a blind eye? Also when corruption task forces are getting close to the source the initiative may be closed down. How does this impact the reality of reporting corruption? Email me if you can’t download the paper. Thanks Caryn and Grant for this piece of article on corruption. I agree that what you noted in your Jakarta survey is not applicable to other society in PNG or elsewhere. The corruption and anti-corruption understanding you have on PNG is an interesting case. The cultural context in which corruption is brewed is an interesting one unlike other corruption or anti-corruption cases elsewhere in the region or the world. Your survey in Port Moresby on corruption and anti-corruption messaging seems to be social specific-meaning targeting one particular group. Just like you going into a classroom and asking students, what they see in the real world and how they prefer to face it. You could rather target persons of mix social standing in the society or in the system, (I understand it is not that easy to do). A survey that can include views and opinions of people in different social standing-that is people at the community and those in the position of authority in the system will give us a balance understanding on corruption and anti-corruption messaging in PNG. One question in PNG context that makes corruption and anti-corruption unique is. Reporting corruption to people in authority or system who have access to corruption and in a position of influencing anti-corruption is a nightmare. That is why a well-known statesman and current MP once coined the term “corruption is systemic and systematic in PNG”. Thanks JK. We do limit our study to Port Moresby but, as we outline in the report, we made great efforts to get the views of different socio-demographic groups. I agree with your concern about reporting in PNG, as we note “reporting also relies on the state providing accessible, safe and reliable reporting mechanisms”. On the other hand, people will be discouraged to report cases if the agencies they are reporting to fails to take any actions. However, the agencies that are taking actions must also report the results back to the citizens to increase citizen participation and trust. We find that people are discouraged to report cases if agencies fail to take action, but this did not deter those presented with the local scenario.